This is a modified version of NitePR therefor will NOT work if NitePR is also enabled. Ever wanted NitePR to have a USB function so you can easily edit your codes? Ever wanted to rename your codes without even having to enter USB mode? What about searching, have you ever wanted to search for text and then continue your search with hex? All this and more is possible with MKULTRA. You can now type in a text search faster by pressing start it will then bring up a keyboard, remember while searching text it only searches CAPS so make sure caps lock is on. 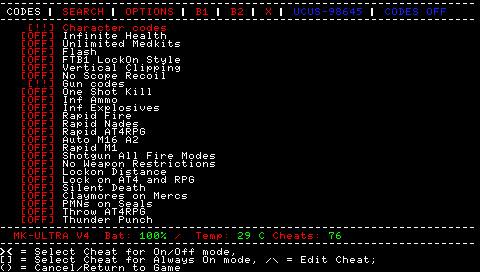 You can now rename cheats, from the nitePR menu by pressing start on the selected cheat. There are two decoders and browsers, go over to one of the browsers and press START it will change to a decoder. 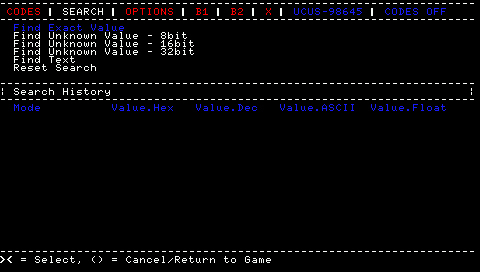 while on the decoder press SELECT and it will show ASCII aka text like a browser. There is also the option for usb in the PRX menu just plugin your usb cable and enable USB in the menu edit your database and use the added Reload Cheats function and the codes are available right away. You can search for text and then look for the same result by narrowing it down with a hex search. Last edited by Prestige; 01-01-2009 at 08:52 AM. Thanks bro I will try when i get my battery so i can update it :P does it work on FTB1? Hmm didn't notice that. That's essential to FTB now a days lol. Not sure on that one. You'll just have to test it out. Also MKULTRA version 3 is release fyi. So its a multiple lined code, hence allowing the use to write longer codes w/o a computer that is if you know good mips and already know where things are located. i cant open it looks like it lock???? Socom is no more fun. A Johnny I had this before but for some reason my codes didnt show I think i had 2 many Codes how many KB of codes can this hold??? Um, lol... read my above post!!!!!!!!!!!!!!!!!!! I explain what you guys keep asking that it only allows 30kb MAX!